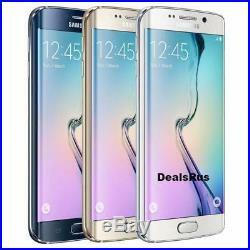 Samsung Galaxy S6 Edge G925V 32GB VERIZON + GSM Unlocked 4G LTE SmartPhone. This item is in Good Condition (B) and will show Moderate signs of use (Scratching/Scuffing) on housing and screen - Fully Functional Comes with generic box charging usb and adapter. Will not work with Sprint and Boost. Model : Samsung G925V Galaxy S6. Key features include a metal frame, quad-HD display, 16-megapixel camera, and touch-style fingerprint sensor. It also supports Samsung Pay via both NFC and magnetic card emulation, and adds dual-standard wireless charging. Other features are similar to the S5, including heart rate monitor and infrared port. Processor: 2.1 GHz Samsung Exynos, 4+4 cores. Wireless Band: LTE 2 / 4 / 5 / 13 WCDMA 1 / 2 / 5 / 8 CDMA 850 / 1900 GSM 850 / 900 / 1800 / 1900. Dimensions: 5.59" x 2.76" x 0.28 (142 x 70 x 7 mm). Weight: 4.66 oz (132 g). Display Resolution: Quad HD, 1440 x 2560 pixels, 576 ppi approx. Battery Type: mAh Lithium-ion Non-Removable. Talk Time: 20 hours max. Battery Standby: 312 hours max. Camera Front: 5 megapixel large pixel size. Camera Back: 16+ megapixel OIS, f/1.9 lens, face-tracking auto-focus, LED flash / auto-HDR, IR detect white balance, panorama, manual mode. Video Resolution: 4K UHD, slow/fast motion modes. WiFi: 802.11 a, ac, b, g, n supports Wi-Fi Direct. Bluetooth: HSP 1.2, HFP 1.6, OPP, PBA, A2DP 1.2, AVRC 1.4, HID, PAN, MAP. Dealsrus365 is committed to our customers. Our top priority is to ensure customers are 100% satisfied from ordering to returning. Please do a hard reset by holding down the volume up button plus home button and power button for a few seconds this will reboot the system and get corrected. Q: Why there is no service or the sim is not working. Please make sure if your carrier requires that. Carriers that do require that are MetroPcs, Cricket, StraightTalk. Q: Why the data is still not working or cant add it. Next is the activation screen. At the bottom right hand side, there is a button that says Use Wifi. This does not mean it doesnt recognize your sim, it just means it is not a Verizon sim. Once you get to the main screen, open up your apps drawer (It is an icon with a bunch of squares called apps) 5. Find your settings (looks like a gear). Once you get to your settings, there will be an option called More Networks, select that. Then on the next screen go to the Mobile Networks. Finally, go to the Access Point Names. There is a Plus symbol on the top of the screen. Select that to add a new APN. You can google your correct APN setting simply by searching: APN settings (enter provider here) Example: Galaxy S5 APN setting t-mobile. Under the System category, tap about device. Tap Software update > Check for updates. Follow the on-screen prompts to download and install the update. The item "Samsung Galaxy S6 Edge G925V 32GB VERIZON + GSM Unlocked 4G LTE SmartPhone" is in sale since Friday, November 18, 2016. This item is in the category "Cell Phones & Accessories\Cell Phones & Smartphones". The seller is "dealsrus365" and is located in Jamaica, New York. This item can be shipped to United States, Canada, United Kingdom, Mexico, Germany, Australia, Denmark, Romania, Slovakia, Bulgaria, Czech republic, Finland, Hungary, Latvia, Lithuania, Malta, Estonia, Cyprus, Slovenia, Sweden, South Korea, Indonesia, Taiwan, Thailand, Belgium, Hong Kong, Ireland, Netherlands, Poland, Austria, Bahamas, Israel, New Zealand, Philippines, Singapore, Switzerland, Norway, United arab emirates, Qatar, Kuwait, Bahrain, Croatia, Antigua and barbuda, Aruba, Belize, Dominica, Grenada, Saint kitts and nevis, Saint lucia, Montserrat, Turks and caicos islands, Barbados, Bangladesh, Bermuda, Brunei darussalam, Bolivia, Egypt, French guiana, Guernsey, Gibraltar, Guadeloupe, Iceland, Jersey, Jordan, Cambodia, Cayman islands, Liechtenstein, Sri lanka, Luxembourg, Monaco, Macao, Martinique, Maldives, Nicaragua, Oman, Pakistan, Paraguay, Reunion, Uruguay.